hack off the plant by our front door, and what to do with all the lemon basil we got in the CSA box this week. Like cabbage and grapes leaves, banana leaves have been used for millennia to wrap food. They are cheap, biodegradable, and sustainable. Unlike grape and cabbage leaves, you can’t really eat banana leaves. Perhaps you can (you can eat the fruit and the flower) but I have never heard of it. 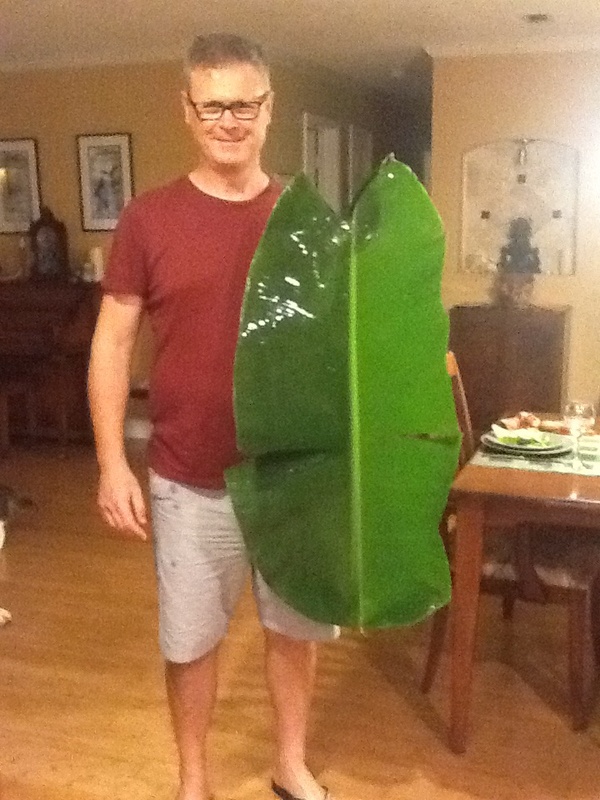 Two large, undamaged banana leaves. Small bunch of lemon basil. One cup of coconut milk. One teaspoon of fish sauce. One teaspoon of crushed coriander seeds. Heat the oven to 350 F. Blend all the ingredients except the tilapia, banana leaves and culantro, in a food processor. Cut each fillets in half, so that they are about as wide as they are long. Pace the fish in a suitable container and pour over the marinade. Cut the stems from the banana leaves and tear the leaves into almost squares so that you have eight squares. The squares need to be big enough to fold over and enclose the fish. Wash the leaves carefully. Place a fillet in the center of each leaf square, add some of the sauce. Add a culantro leaf. 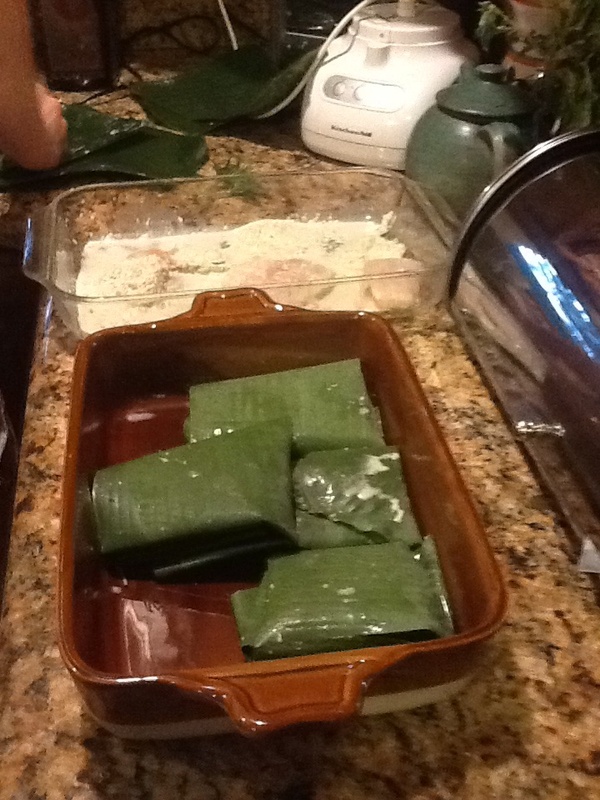 Fold the two sides of the banana leaf square over the fish and then fold the other two ends to form a packet. Place the packets in a baking tray, with the folded side down so that they do not come apart. They can overlap. If you are a belt and braces kind of person, cover with tin foil. Bake in the oven for 15 to 25 minutes (depending on the thickness of the fish.) You can check to see if they are done by opening one packet and seeing if the fish flakes apart. Serve with rice. Note that I left out the chili peppers from my version. This is a delicate, fragrant, dish that I don’t think needs the heat. It is fun to let everyone open their own packets at the table. It can be messy, but the fragrance of the packets as they open is one of the pleasures of the dish. Tilapia is one of our most sustainable fish species, especially when it is farmed in ponds in Latin America. The fish grows quickly, is largely vegetarian, which means producers don’t have to catch fish to feed to fish, and since it grows in ponds (or sometimes tanks) it has less impact on the environment, if managed properly, a big if. Many people seem to object to fish farming because it seems unnatural, but that strikes me as silly. Fish seem to be the last major food source for which we rely on wild resources. It is akin to relying on hunting for meat, or gathering for vegetables and grains. We are not going to feed seven billion people with hunter-gather techniques. So let’s farm fish if we are to eat fish at all. Sure, it will impact the environment, but so does agriculture. The question is can you do it in a sustainable, productive way without too much unwelcome impact on the natural environment? Only if we stop pillaging the oceans and farming predatory fish like salmon and start eating bait fish like sardines and farmed tilapia.